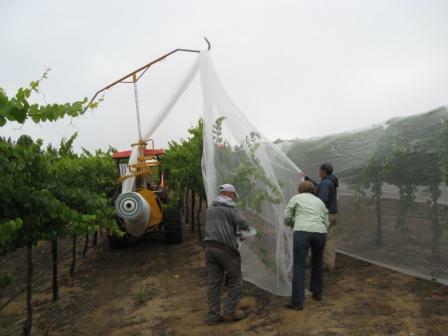 June's big project was getting the new bee netting on the vineyard. We way underestimated the amount of work involved in this project. 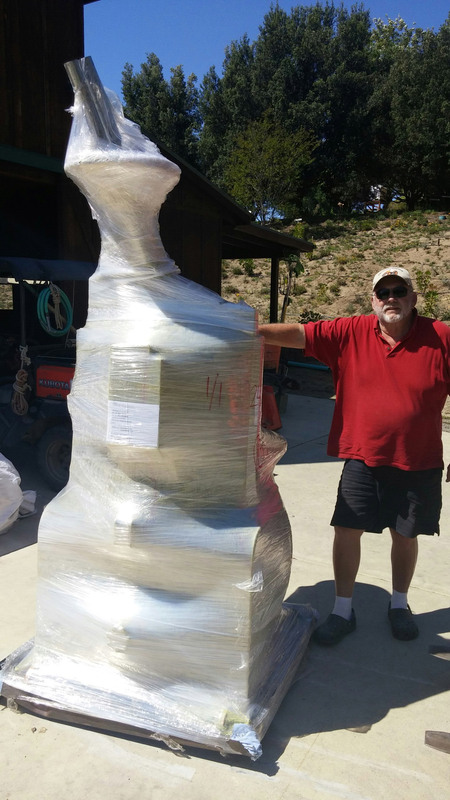 The cool attachment for putting the nets on came from Australia. We picked it up after it arrived and it looked like a piece of modern art. A couple of days of assembly and voila! We had an incredible heat wave last week. It hit 112 for two days. 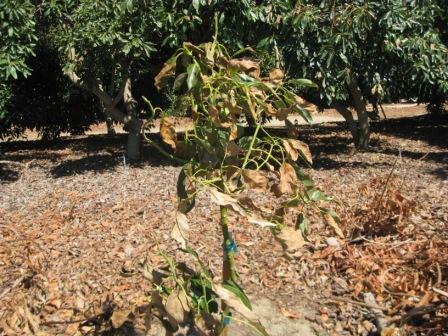 The avocados in De Luz and San Diego county really suffered some losses. It's amazing the damage that an extra 10 degrees can do. Most of the vineyard only sustained 5 - 10% damage. The Syrah, however, looks like about 30 - 40%. 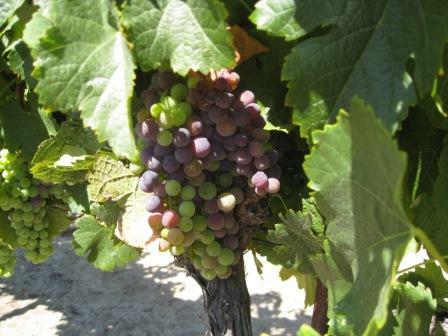 The Merlot, Pinot and Chardonnay are looking great, not much damage and now in veraison. 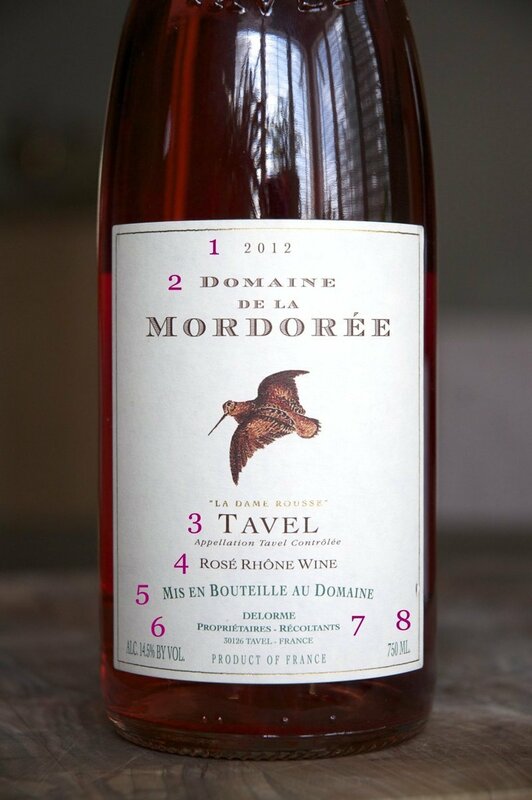 Unlike wine labeling in the United States, labeling laws in France are incredibly strict. French wines are labeled by region not by grape variety. A Bordeaux, for example could be a Merlot, Cabernet, one of several other varieties or some combination. Unless you know the specific vineyard, you may not know exactly what you are drinking. Using the picture below, here are some of the French label basics. 1 - Vintage, 2 - Producer, 3 - Appelation or sub-region, 4 - Region & style, 5 - Translates as "bottled at the estate", 6 - Alcohol content, 7 - Winery address, 8 - Volume. You will notice that while we know from the label that it is a Rose from the Rhone region, we don't really know what the grape variety is. 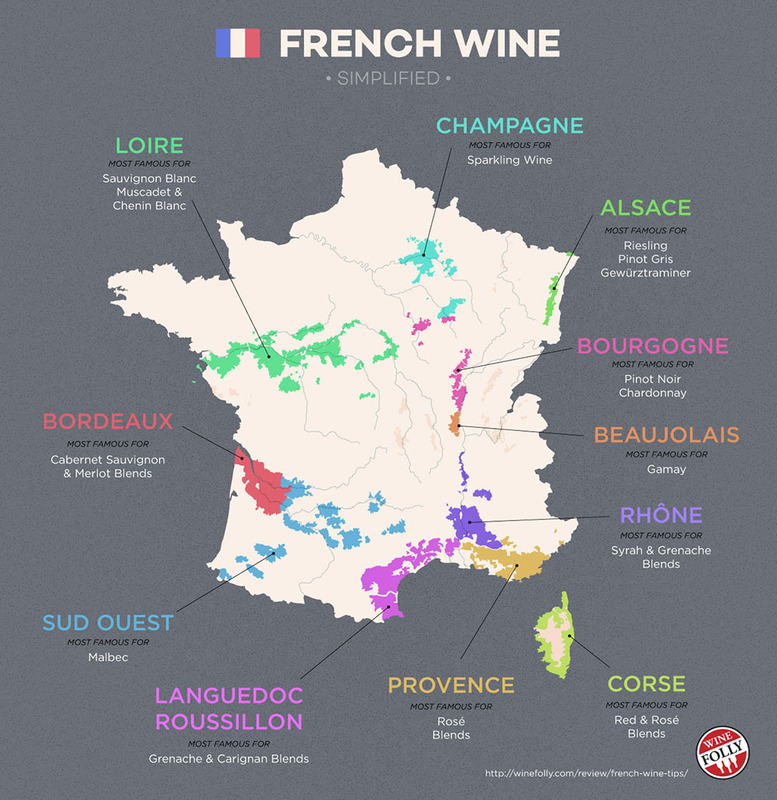 There are six major regions for French wine (and several lesser known regions). So, if you get a bottle of French wine you to understand the primary grapes grown in the region to get an idea of the wine. Bordeaux is know for bold red blends, generally based on Cabernet and Merlot. The primary red grapes grown are Cabernet Sauvignon, Merlot, Cabernet Franc, Petit Verdot, Malbec & Carmenere. Generally you will find that Bordeaux wines are full bodied, dry and earthy. This is the center of the world's sparkling wine production. The primary grapes are Pinot Noir, Chardonnay and Pinot Munier. Champagne region is known for sparkling wines with high acidity. As you probably know you can't call your sparkling wine a Champagne unless it comes from the Champagne region. Burgandy is equally famous for both red and white wines. The vineyards in Burgundy were sectioned off by monks hundreds of years ago, so it is a very intricate growing area. 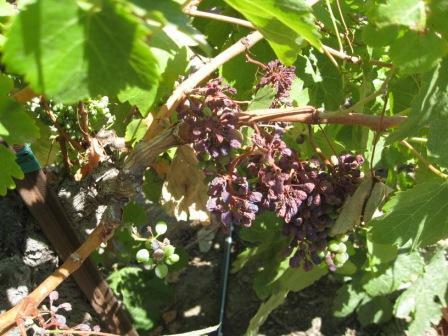 The primary grapes are Pinot Noir, Chardonnay and Gamay. Burgundy wines are light bodied, dry reds and Chardonnays that can be crisp and steely or richly oaked. Alsace has a long history of Germanic influence with the easiest labels to understand since they are mostly labeled by grape varietal. Love that German organization! The primary grapes are Riesling, Pnot Gris, Gerwurztraminer, Pinot Blanc and Muscat. Alsace is know for it's crisp, dry whites and a few delicious dessert wines. The Rhone region is very diverse. It has searing hot areas in the south and frigid mountains in the north.. The primary grapes are Syrah, Grenache, Mouvedre and Viognier. The Rhone is known for is wild, gamey reds; rich aromatic whites; and bone-dry roses. The Loire region follows the Loire river. Virtually every style of wine is made there. The primary grapes are Cabernet Franc, Sauvignon Blanc and Chenin Blanc. The reds and the whites are general herbaceous and mineral-driven. There is also a lot of sparkling, sweet and rose wines made. So, stop by your local wine store and try out your label reading skills. Summer is here and it's time for the beach, camping, BBQ's, porch sitting and trashy novel reading. A common theme to all these activities is junk food and adult beverages. My favorite adult beverage is wine, so naturally I want to make sure that my cheese doodles are paired with the right wine. About 6 years ago Patrick Bartlett (my favorite chef) and I got together and worked out some junk food pairings. We've updated the pairings for our current wines and obviously evolving tastes. Here are the recommendations. Bon Appetit! Have you heard about 'Slow Food'? Well, July is 'Slow Pickup'. Our July Pickup party will start on Friday, July 8 and end on Sunday, July 17. Come in to Crush & Brew any time during those dates and pick up your wine. Have a complimentary cheese plate & wine before you pick up your shipment. Just tell them you are a Woodworth Wine Club member and they will take care of you. While you are there, stay for lunch or dinner. The menu is great! 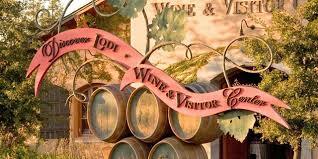 Here are some interesting recent articles about the California wine country. Thought you might enjoy checking them out. 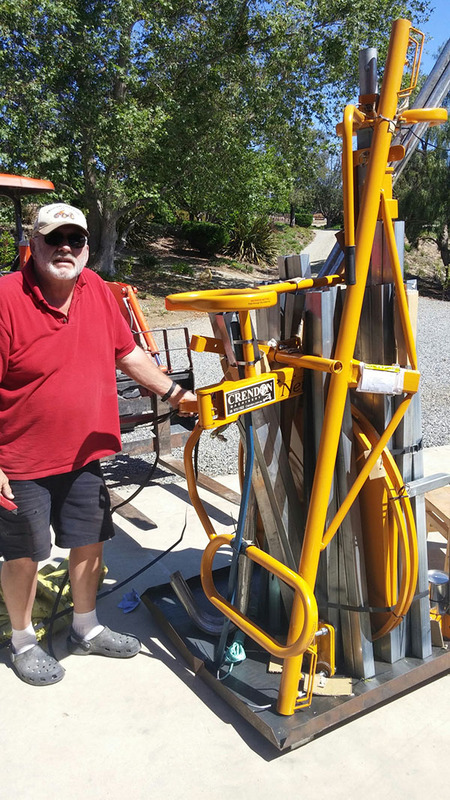 Forty five miles east of San Francisco sits Frank Evangelho's vineyard. It's a sandy beach of a vineyard. Its 130 year old, head trained grapevines might look like coastal dune grass to the casual glance. PG&E owns the property. Transmission towers crown it, electrical lines canopy it, railroad tracks form its northern border. It faces a motel with rooms for rent by the hour. Yet Evangelho Vineyard is one of California's most precious viticultural treasures. The Wonderful Company, the corporate arm of Beverly Hills billionaires Stewart and Lynda Resnick, promotes itself incessantly as an exemplar of social responsibility and a guardian of sustainable agriculture. Don't tell that to the company's neighbors in Paso Robles, the heart of California's Central Coast wine country. 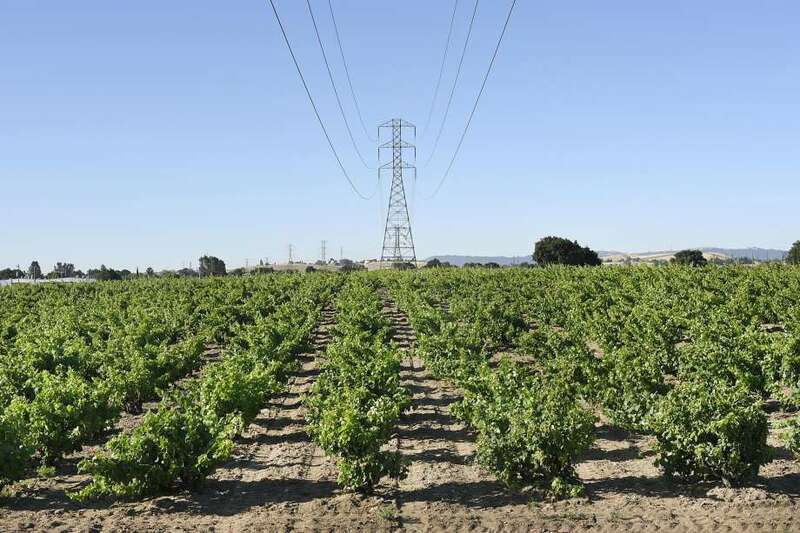 The Lodi area grape and wine industry is coming up roses, or perhaps that should be Rose. Lodi has come out on the right side on a yawning divide in the wine industry - lower riced wines, those generally less than $8 a bottle are falling in volume and dollar sales while higher priced premium wines are rapidly growing.